Today I am reviewing the ActiFry for all of you from the wonderful company known as T-fal which has been around for many years! If you are not familiar with T-fal, they sell a wonderful line of cookware, bakeware and even small appliances like deep fryers, toasters, toaster ovens, irons, etc. The ActiFry is a unique kitchen appliance that has been engineered with innovative heat-pulse technology. With this one kitchen appliance you and your family can enjoy delicious tasting homemade meals that have been made in this versatile low-fat multi-cooker that uses ONLY one tablespoon of oil. The ActiFry unit has its own built-in pulsating heating system and stirring paddle and can make single serving dishes or a meal for a large family quickly and easily. The ActiFry is very versatile and can be used as a roaster, stir-fry pan, a healthy fryer or a quick slow cooker. It is available in a white or black color so it will go with any kitchen decor you may have. You can cook just about anything in the ActiFry such as: various red meats, various white meats, fish, risotto, vegetables and even desserts! It comes with a really cool recipe book that is filled with easy recipes that you and your family will enjoy. You can find additional recipes for the ActiFry by visiting their web site. The ActiFry is really easy to use! You simply add in your ingredients into the nonstick pan, close the lid, set the countdown timer and turn the machine on. When it is done cooking your food it will beep several times letting you know that your food is done. The Actifry can make up to 4 servings at a time so I think it is perfect for couples and small-sized families. The lid, nonstick ceramic coated pan, paddle, filter and spoon are all dishwasher-safe so feel free to toss them into your dishwasher on the top rack. To clean the base you simply wipe it down with a damp cloth and air or towel dry. Versatility: You can make a broad range of meals all in one machine! Convenience: Automatically cooks your food at a constant temperature of 338 degrees, while the paddle stirs the food. You can go and help the kids with their homework or do something else around the house as it cooks your food. Healthy: Your favorite dishes are healthier due to little or no oil required. Easy: The machine is super easy to operate, nothing complicated about it! Safe: The closed cooking vessel provides safe, splatter-free cooking. Odorless: This unit emits no frying odors so if you are cooking fish or other smelly foods...you don't have to worry about airing out your house! In my new ActiFry two of the first things I made were some fried potatoes and some fried beef sandwich steaks with mushrooms and onions. I added in only 1 tablespoon of vegetable oil for when I made the fried potatoes and added in only 1 teaspoon of vegetable oil for when I did the sandwich steaks, mushrooms and onions. The fried potatoes took 17 minutes to make from start to finish and while they were cooking I went and did my laundry. The beef steak with veggies only took 6 minutes from start to finish and while that cooked I was able to unload and load up my dishwasher. I am telling you what I did as I want you all to realize that once you close the lid...you can walk away and do something else in your house! You don't have to stand there stirring your food as it cooks! Clean up was quick and easy! I tossed the parts into my dishwasher on the top rack and simply wiped the base down as they suggested in the instructions. The parts came out of my dishwasher sparkling clean and I love how they all store inside of the base unit to help me save on storage space. Another thing I love about this ActiFry is the clear steam-free lid, I can see my food cooking inside at all times and do not need to open the unit to release steam or to check on my food at all. 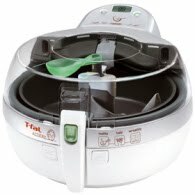 Since receiving the Actifry from T-fal I have used it for several different meals from making beef, fish, poultry to even some stir fried vegetables! I am absolutely IN-LOVE with my new ActiFry by T-fal and next week I will be entertaining some friends so I will be using the ActiFry to make their recipe for Sweet and Saucy Meatballs next! yummy! This is a wonderful kitchen appliance from the great folks over at T-fal and I am looking forward to continuing using it here in my own home. I give the product 10 stars out of 10 stars on my rating scale and highly recommend it to you! Purchasing Info: You can purchase the ActiFry kitchen appliance from numerous retailers for around $249.99. You can find a list of retailers directly on their site or by clicking ---> HERE. I would personally like to thank the great folks over at T-fal for sending me the ActiFry to review for all of you. Over the next couple of weeks I will be sharing with you some great recipes from things I make in my new ActiFry cooker! I love this appliance! I never would have thought about doing stir fry veggies in there, but what a great idea! I eat those a lot!